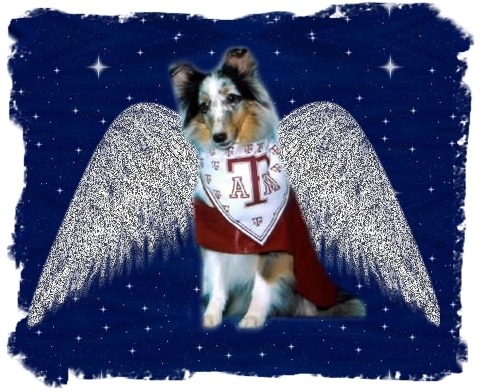 Tribute to Shalaine's Celtic Mist ~ "Misty Mouse"
Nearly eleven years ago a very special little blue merle sheltie girl was born. By six weeks of age it was apparent that she would be tiny and indeed she measured only 11.25" tall. At that tender age, she was climbing to the top of her 36" exercise pen and jumping to the floor to run around the house. After three times of this, she reverted to just climbing to the top of the pen and perching there, watching the world go by. As an adult she could clear that same 36" pen in a single leap. At four months of age, just 9" tall, I found her in the middle of the dining table playing with the kitten. A friend dubbed her "Misty the Wonder Mouse" and Mouse got her nickname. Misty Mouse was a delightful little girl with endless love. But she knew there were monsters in the world and she was very uncomfortable outside her safe areas, such as mom's lap and her sherpa bag. Many of you might remember her in her sherpa bag under my vendor's table in Virginia Beach in 1999. 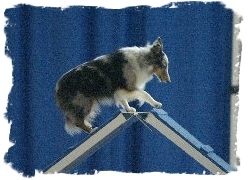 She went on to conquer those worries and earn eighteen agility titles. She was within four qualifying runs of her Masters Preferred titles when chronic shoulder instability forced her retirement from agility at 9.5 yrs of age. Not to be stopped, our little Mouse earned her Rally Novice title at 10.5 yrs of age in three shows. The past two years she was very active as a therapy dog, working closely with children in the grief support program at our local hospice. She also visited hospice patients as well. 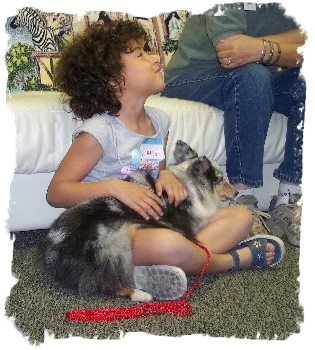 She was part of the therapy dog team that traveled to Birmingham, AL in June 2007 when her mom and Kerry Dowler, children's grief program coordinator, presented a program on the use of therapy dogs at the national children's grief support symposium. One week ago, she presented with symptoms of anemia and thrombocytopenia. 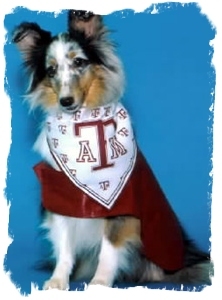 I took her to TX A&M, to the vet school she was so familiar with through her work in the Dermatomyositis studies over the past ten years. She was admitted to ICU, a very sick girl looking at the lab results, but bright, alert and very responsive. She spent five days in ICU with lots of visits to mom as the wonderful caring staff of doctors and vet students battled to reverse her problems. On Tuesday, February 5, it was obvious that this was a battle we would not win. I elected to honor Mouse's wishes and take her "home". Home was a friend's house there in College Station. She had part of my hamburger for supper, enjoyed a nice long walk in the big backyard and slept in the bed beside me. The next morning she had more time in the yard with her sheltie buddies and then spent a quiet morning with mom. 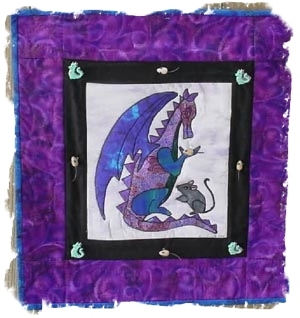 In the early afternoon, outside where she was happiest there at the vet school, on a blanket in mom's lap with her dragon fighting buddy Flair beside her and surrounded by friends who loved her, Mouse got her wings and went to the Rainbow Bridge. Most of us are fortunate enough to have at least one special "heart" dog. Misty Mouse was one of those, and she touched the hearts of many who knew her. 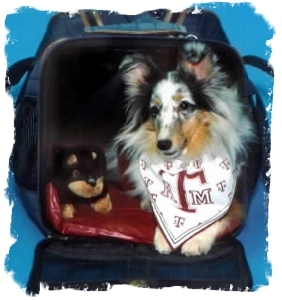 She became the face of Dr. Christine Rees' Dermatomyositis studies and she did multiple public appearances for that cause, including the 2002 ASSA symposium. 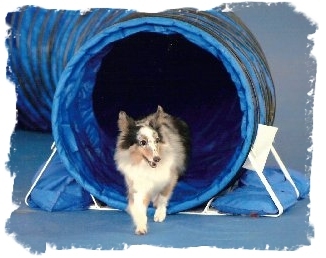 I've included photos of Mouse as the DM poster dog, in agility and in her therapy work. I invite all those who knew her, and all those with special heart dogs, to join me in a celebration of her life. If any of you have stories, memories, artwork, photos, etc that you would like to contribute to the memorial album I'm putting together for her, please feel free to share those with me. Also please feel free to share this post with others that I may not have thought to address. No, she wasn't a conformation star, she was spayed before she ever had a season, her agility titles were hard won and she never set the agility world on fire, but she touched many many lives and I hope that all of those she touched remember her with fondness. Give your own special dogs a extra big hug today, in memory of Misty Mouse. Farewell my little one........may your new angel wings take you safely to the Rainbow Bridge where I will meet you again, in another time. Flair will now handle those "stinkin' boy dogs" by herself, until another little girl comes along to try to fill your special shoes. Copyright © Shalaine Shetland Sheepdogs. No pictures may be copied without the owner's written permission. Background designed by Kissin' Bandit Design. Designed and Maintained by Kissin' Bandit Design.